# Added trees and rocks. # Added new weapons, like a guass sniper. 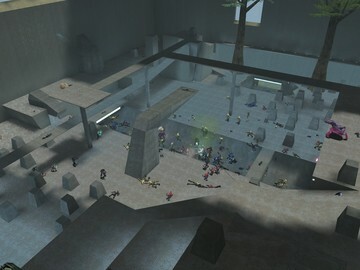 # There is more A.I in the map, resulting in a bigger battle. # Added vehicles like, Banshee, ghost and warthog. I also added a turret overlooking the battle. # Added in a crashed lifepod to where you'll spawn next to. # Got rid of all player spawn points and added only on to spawn in. # All of the A.I will now kill you if you get to close. # Weapons will not respawn once used, you'll have to restart the map. I don't know how to fix this. # This map is not compatible with CTF. You'll encounter a screen that is overlooking the map, and it will freeze. I don't know if thats just my pc.